Image: FLETCHER rocket system fitted to a Polaris MRZR X vehicle. Arnold Defense, the St Louis based manufacturer of 2.75-inch rocket launchers, will be at this year’s AUSA Global Force Symposium & Exposition to showcase their FLETCHER Laser Guided Rocket Launcher. Global Force 2019 will take place 26-28 March 2019 at the Von Braun Center, Huntsville, Alabama. 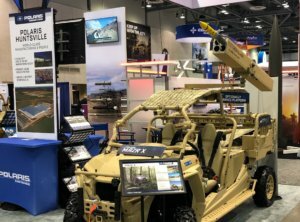 The FLETCHER 2.75-inch/70mm weapon system will be on display mounted on the Polaris MRZR-D4 off-road vehicle in booth #1011, and with BAE Systems in booth #1219. With FLETCHER, Arnold Defense has made a bold departure from the traditional concept of use for 2.75-inch rocket systems; that of an area suppression weapon delivered by aviation assets. Arnold’s evolution has FLETCHER using advanced rocket-guidance technology to utilize ground-based launch platforms, meeting the demands of modern, vehicle-mounted and dismounted asymmetric warfare. FLETCHER’s unique design allows for ease of operation, maintenance and sustainment. It employs an existing suite of guidance modules, rockets and warheads, already used in well-known programs and readily available to global forces. FLETCHER can engage targets at ranges of up to 5km, with equivalent laser target designation ranges, giving land forces a capability previously only available with the employment of air or aviation assets. Following exceptional levels of international interest, Arnold Defense is developing a number of supplementary ground and maritime-based concepts. These exciting new concepts will expand FLETCHER’s utility into the arena of Unmanned Ground Vehicles (UGV), naval and littoral platforms. FLETCHER is supported by a team of global defense industry companies, collaborating under Arnold Defense’s leadership to combine their complimentary expertise.